The Narrative Dice System was first created by Fantasy Flight Games for Warhammer Fantasy Roleplay (3rd Edition). It was later employed for their Star Wars RPGs and Genesys. It received its name in that last RPG. The core mechanic of the system is a skill check that is made with several dice. The character's attributes and skill add positive dice to the pool, whereas the difficulty is set by a number of negative dice added. Circumstances may add more dice. If the player rolls more successes than failures, the action is a success. However, the dice show other symbols in addition to success/failure. 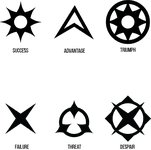 Other symbols may provide side effects or trigger a critical success of failure. Compared to more straightforward tests, this mechanic offers a wider range of outcomes. It also offers a tool to explain the outcome of the text. For example, if only the character's attribute dice contributed to the success, the story may become that the character's training was not of much use for the specific task. The exact combination of dice, and the names used for the dice and the symbols on them, differ from RPG to RPG.